"M151" redirects here. For other uses, see M151 (disambiguation). TOW missile being fired from M151A2. The M151 Military Utility Tactical Truck (M151 MUTT) was the successor to the Korean War M38 and M38A1 jeep Light Utility Vehicles. Commonly referred to as a "jeep" or "quarter-ton", it was produced from 1959 through 1982 and served in the Vietnam War. The M151 had a monocoque design making it roomier than previous jeep designs, and incorporated an independent suspension with coil springs. It has since been replaced by the larger AM General HMMWV in most utility roles in frontline use. With some M151A2-units still in U.S. military service in 1999, the M151-series achieved a longer run of service than that of the WW2 MB/GPW, M38 and M38A1 series combined. In 1951 Ford Motor Company was awarded the contract to design a 1/4 ton 4x4 Military Utility Tactical Truck (hence MUTT) to replace the M38 and M38A1 model jeeps. The M151 'MUTT' was developed with guidance from the U.S. Army's Ordnance Truck Automotive Command. Design started in 1951 and testing and prototyping lasted through most of the fifties. Although the M151 was developed and initially produced by Ford, production contracts for the M151A2 were later also awarded to Kaiser Jeep and AM General Corp. Unlike some other military transports, such as the Humvee or Jeep, the M151 was never widely released into the civilian market. This was partly because the military claimed that it did not meet Federal highway safety standards for civilian vehicles, and also because of a series of early rollover accidents. While these were often blamed on the independent suspension (which played no small part), they were also due to driver errors, with operators unprepared for the increased performance compared to the Jeeps which it replaced. At high road speed, the rear suspension in a lightly loaded MUTT had a tendency to tuck under the vehicle during turns, causing it to roll. The vehicle's tendency to roll over was reduced when there was weight in the rear, so drivers would often place an ammunition box filled with sand under the rear seat when no other load was being carried. The box could simply be emptied or abandoned when the extra weight was not needed. The handling issues were eventually resolved by a redesign of the rear suspension, introduced in the M151A2 model. However, due to liability concerns, the U.S. Department of Defense deemed all M151 series vehicles "unsafe for public highway use", limiting their public use. In the early 1990s the M151s began being phased out of service in favour of the HUMVEE, and very few (perhaps 1000) were sold via Government Surplus auctions, and those that were not sold via Foreign Military Sales overseas were cut into four pieces and scrapped. However some individuals were able to buy these "quartered" M151's and simply welded the four sections back together. Continuing problems with vehicle roll-overs into the 1980s led the US military to retrofit many M151 series vehicles with the "Roll over protection structure" (ROPS), a roll cage intended to protect both front and rear seat passengers. First put into service in Vietnam, the MUTT played an active part in American military operations well into the 1980s, when it was phased out in favor of the Humvee. Despite its official replacement, the M151 had some distinct advantages over its much larger and heavier successor, like being small enough to fit inside a CH-53 heavy transport helicopter. This flexibility was one of the reasons the U.S. Marine Corps deployed M151 FAV (Fast Attack Vehicle) variants through 1999, in places like Kosovo. It currently serves in U.S. special forces units as a FAV. Various models of the M-151 have seen successful military service in 15 different NATO countries and M151s were sold to many countries, including Canada, Denmark, the United Kingdom and non-NATO countries like Egypt, Lebanon, Israel, the Philippines, and Pakistan. Currently, the M151 is used by over 100 countries worldwide. A Growler Light Strike Vehicle for the U.S. Marine Corps in December 2005, with a towed mortar. American Growler designs and sells a line of Light Utility Vehicles based on the M151 drivetrain. The Light Strike Vehicle which was reduced in size to fit into the V-22 Osprey tiltrotor transport is an all new design and contains no M151 parts or design elements. M151 (1960) - Initial version. Because of its rear suspension design it had a dangerous tendency to flip over when cornered too aggressively by unaware drivers. The coil spring and swing-axle rear suspension lay-out (similar to the rear suspension of the early-model Chevrolet Corvair) could result in large rear wheel camber changes, causing drastic oversteer and a subsequent roll-over. 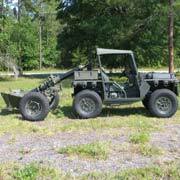 M151A1 (1964) - Second version: minor changes in the rear suspension, mostly aimed at allowing the vehicle to carry heavier loads. Addition of turn signals to front fenders. The essentials of the rear suspension remained unchanged and the same applies to the handling problems in corners. M151A1C - The M151A1C equipped with a 106 mm recoilless rifle on a pedestal-mount. Capable of carrying six rounds of ammunition and weapon tools. Including the driver, it provides space for two men and has a cruising range of 442 km or 275 miles. M151A1D - Tactical nuclear variant. This was an M151A1C modified to mount the Davy Crockett Atomic Demolition Munition (in parallel development with a similarly equipped M38A1 and other tactical vehicles). M718 - Front-line ambulance variant that featured an extended rear body to allow the transport of litters. M151A2 (1970) - The A2 fielded a significantly revised rear suspension that greatly improved safety in fast cornering. The MUTT now had Semi-trailing arm suspension comparable to what most late eighties premium German cars had. Many smaller upgrades including improved turn signals. The A2 can be identified by the large combination turn signal/blackout lights on the front fenders, which also had been modified to mount the larger lights, as opposed to earlier A1's that had flat front fenders. M718A1 - Front-line ambulance variant. M825 - Variant with M40 106mm recoilless rifle mounted on rear. It had racks in the cargo bed to carry 4 shells. M151A2 FAV - Fast Assault Vehicle variant designed to be carried inside a CH-53 helicopter. Modification mainly involves adding a combination radiator grille armor plate and spare tire carrier, a field radio bracket between the front seats, roll bars or roll-cage, and high-beam lights. It has a heavy weapons pedestal mount post mounted on the rear deck (capable of carrying a Browning M2HB, Mark 19 Automatic Grenade Launcher or TOW II Missile). The rear bustles had brackets to mount large storage baskets and the front bustles had brackets to mount small storage baskets for fuel jerry cans or single ammo boxes. Marine FAV Mk I "Super Jeep": Models originally had a flat black paint job and a velcro-fastened cloth "blackout panel" that covered the dashboard gauges. The front-mounted roll bar, which replaced the front folding windshield, was made from threaded heavy-gauge pipe. Marine FAV Mk II: Models originally had an ERDL "woodland" camouflage paint job and a welded roll-bar that was reinforced with two angled support braces of heavy-gauge welded pipe between the front seats. Had two high-beam lights mounted under the top of the rollbar. Highly customized by the units converting it; one model shown had a DIY shotgun rack that mounted on the driver's side dashboard. Airborne FAV (AKA Ranger FAV): Has a forward-facing M60 GPMG or M240 MAG GPMG in a M32 45° weapons mount welded to the dashboard on the front passenger side, a horizontal storage box containing an AT-4 Anti-Tank Rocket, and a vertical storage rack behind the front seats that holds 8 to 10 M72 LAW Rockets. The rear bustles can mount locker baskets that can each contain 4 x M2 / M2A1 Ammo Boxes for the main gun and the front bustles can contain single ammo boxes for the M60. Air Force FAV: Has a roll cage and a 360° ring mount over the rear seat. This model was designed by Marine Sgt. David Ferry and saw service with the MEUs and other Special Operations units. It got the nickname of "Air Force FAV" from a famous picture of U.S. Air Force Major General William S. Hinton Jr., commander of Joint Task Force Shining Hope, getting out of one. M151A2 TOW - tube-launched, optically-tracked, wire-guided (TOW) anti-tank missile variant. M1051 - Firefighting variant which saw exclusive use by the Marine Corps. MRC108 - Forward Air Control variant, with multi-band communications equipment. Saudi Arabian-used M151s in the Gulf War. Indonesia - Granted by the U.S. government, consisting of mostly former Vietnam War-era models, also used with civilian license plates by Indonesian civilians, due to a military inventory write off. Saudi Arabia - Saw usage during the Gulf War. Asterisk indicates not listed in Annex C Appendix II of US Army Technical Manual of Foreign Military Sales. TM 9-2320-356-BD "Battlefield Damage Assessment and Repair, Washington, D.C. 18 December 1987"
Wikimedia Commons has media related to Jeep M151.